Although Honda has yet to dive into the pure sport side by side segment, it hasn’t ignored it all together. While the Pioneer platform is arguable a utility machine, there are sporty elements infused that at least suggest Honda had the weekend warrior in mind during the design process. 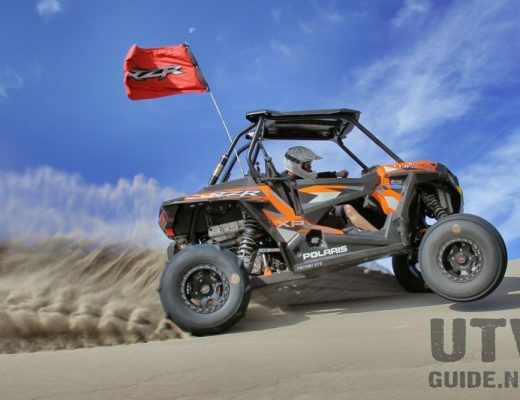 You likely won’t be winning any races on a Pioneer model, be it the 500, 700 or the 1,000, but if you’re looking for a good all around UTV that’s a serious workhorse and capable of taming a trail every now and again, then it certainly fits the bill. I’ve had the good fortune of having a Honda Pioneer 700-4 in my possession for about seven months now and have put it through the paces in a variety of different environments. Being on the east coast, there’s no open dunes or desert to speak of but we do have trails. Lots and lots of trails. Additionally I have access to a working horse ranch were the Pioneer with it’s multi-functional dump bed came in incredibly handy for any number of tasks. Of course the defining feature that sells a UTV as a utility model is the dump bed. 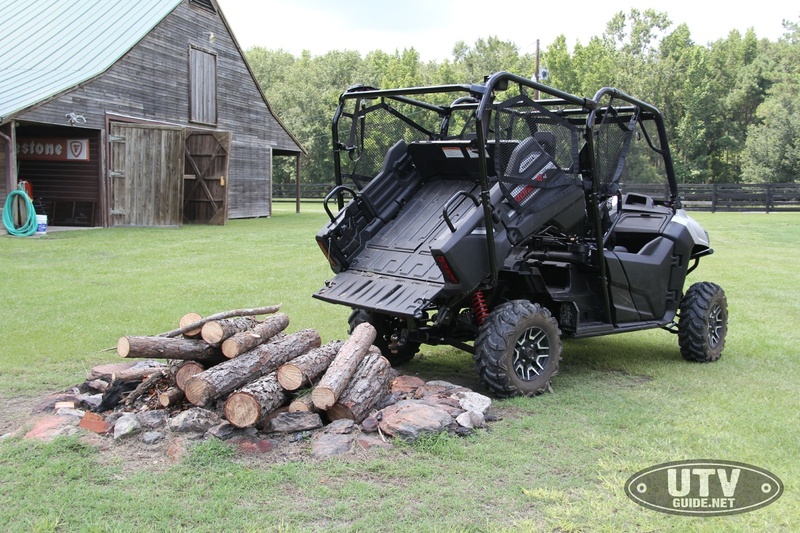 While the 700-4 is down on displacement compared to other models, it shares the same 1,000 pound bed capacity as its older sibling the Honda Pioneer 1000 as well as the Polaris Ranger 1000 and Can-Am Defender 1000. That’s a lot of rock, hay, soil or whatever else you find yourself needing to haul and in the event the bed is just too small to carry it, the Pioneer 700-4 can tow up to 1500 pounds. I will say, that’s probably where the lower displacement is most noticeable. Not that it bogs down but you can definitely feel it when the rear end is loaded. Whether you’ve got the bed loaded down or you’re pulling a heavy load, the rear end tends to squat and the machine is a bit slower to respond. Not a problem by any means because its not that often that you’re “racing” to get a job done, but if you’re regularly carrying a heavy load, it might be worth paying extra for the Pioneer 1000 model. Like most utility side by sides, the Pioneer 700-4 features a bench seat and half doors, that do a great job of keeping mud out. 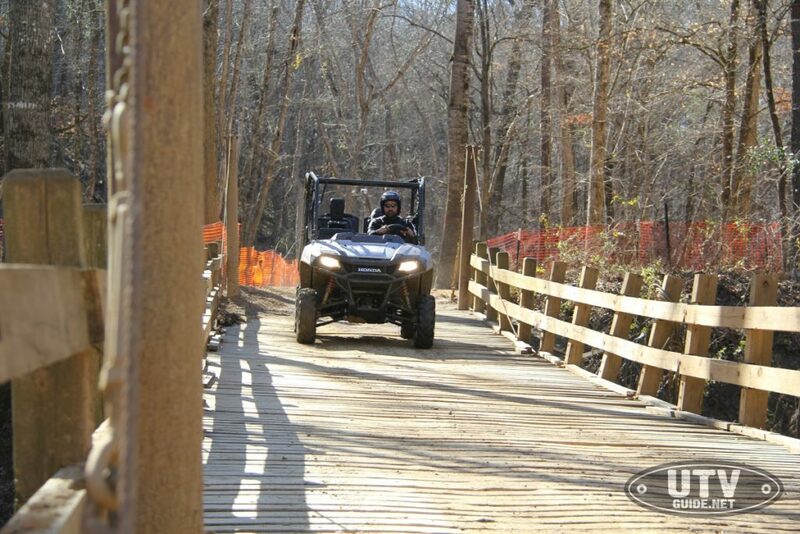 I stayed relatively clean on my first voyage to Carolina Adventure World considering the muddy conditions. It’s easy to slide in and out although I’m undecided about the factory side nets. If you happen to be riding in brushy areas, they are great for keeping tree limps out of the cab but if I were using the machine exclusively for work, I would probably remove them. 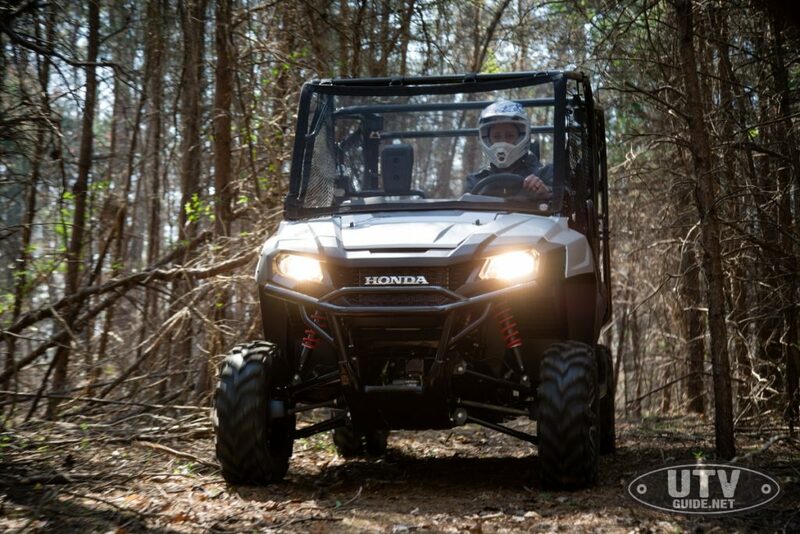 As previously mentioned, there’s no doubt Honda engineers designed the Pioneer 700-4 platform to appeal, at least in part, to sport minded consumers and that is apparent in two specific areas. First, the three speed transmission with optional paddle shifting. With the simple flip of a dash mounted switch, operators can choose between automatic and full on manual mode when the terrain or circumstances demand it. I found having the ability to control when the machine would shift incredibly helpful, particularly when having fun on trails. Not that you’re going to be blazing down the trail in the Pioneer, but maintaining higher RPMs and shifting on demand certainly makes for a sportier ride. The second dead giveaway that Honda intended this machine to be used for recreating are the incredibly convenient QuickFlip seats that fold up out of the bed. 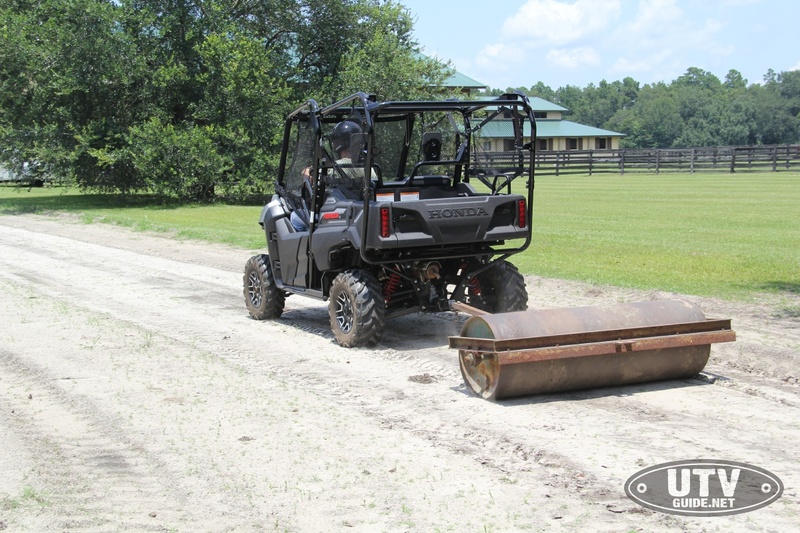 The Pioneer 700-4 transforms from a 2 seat utility machine to a four passenger fun mover in less than 60 seconds. 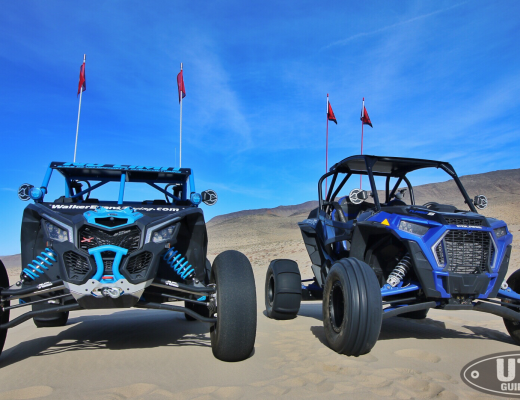 Best of all, because of its shorter wheelbase, you won’t feel at all like you’re driving a longer four person UTV which makes navigating trails much easier and more enjoyable. Granted, with four full size adults in tow, you’ll notice the added weight but for a family of four with a couple small kids, the Pioneer 700-4 is machine enough to make for an exciting off-road adventure. Electronic power steering comes standard as does engine braking which works incredibly well. I found that I seldom had to touch the brake pedal while making my descent in hilly areas. A belt-less direct drive transmission means Honda had reliability in mind and you can rest assured that you won’t wind up stranded somewhere with a broken belt. With just over 10.5 inches of ground clearance it’s unlikely that you’ll be doing any rock crawling with this machine but should you come across a rough patch of ground on either the trail or the farm, 4 wheel drive with differential lock has got you covered. I found more than a few sections of trail that merited locking it in and I am glad that I at least had the option. 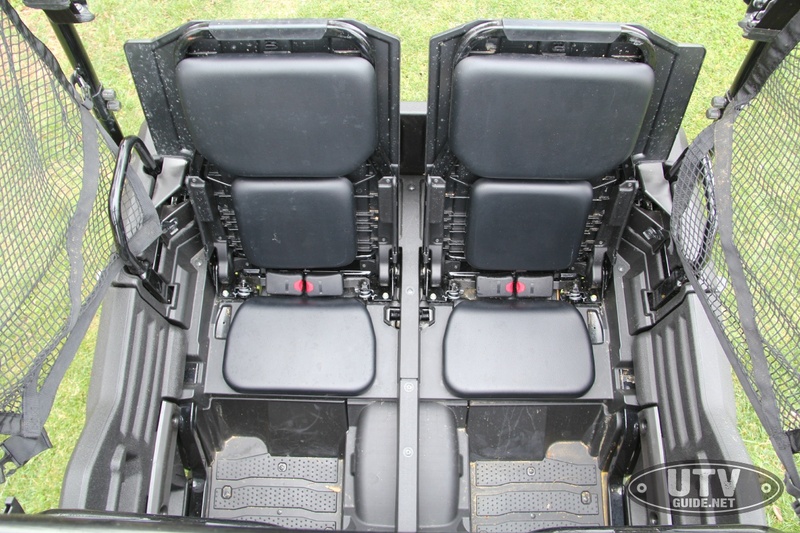 In the suspension category, the Pioneer weighs in about where I would expect from a mid level utility machine with just under 8 inches of travel in the front and just over 9 in the rear. Dual a-arm independent suspension is found on all four corners. The 25 inch OTR HP-007 tires are much more aggressive than you’d typically find on a pure utility vehicle and I’ve been incredibly impressed by the durability despite just a 4 ply rating. Hydraulic disc brakes with 220 mm front discs and a single, center 170 mm disc work exceptionally well. If I had to pick something to change, I would like to have some adjustability in the suspension. The gas charged shocks offer spring preload adjustment only and having the ability to tune them, even a little bit, would be a major plus. Catching a flat edge or a surprise bump while traveling at any sort of speed was somewhat unpleasant but I’m also keeping in mind where this model falls in the spectrum of Honda’s offerings. The only other issue I had was with the QuickFlip seating safety latch that intermittently caused the dump bed not to fully release. Two small latches designed to grip the frame ensure that the bed isn’t accidentally triggered while the QuickFlip seats are up. When the seats are down, small levers disengage the latches but sometimes they would not fully release, causing the bed not to dump. 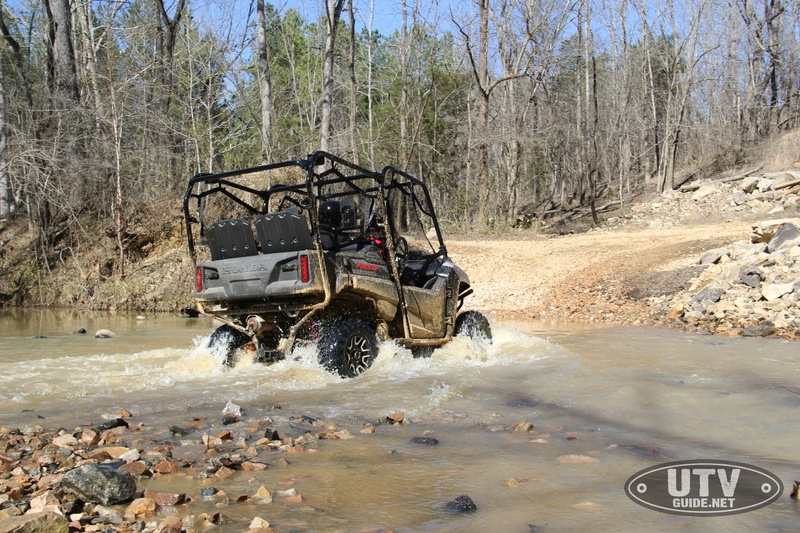 All in all the Pioneer 700-4 is an excellent multipurpose platform that excels as a workhorse and is a capable recreation machine. 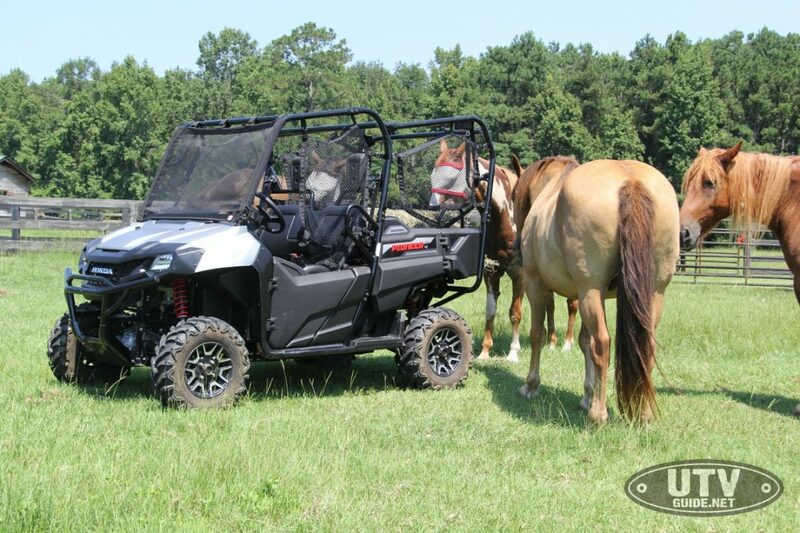 I’ve recommended it to several friends who are interested in purchasing a work UTV for their property but who also love the idea of hitting up a trail every now and then. In my opinion the convenience and versatility offered by the QuickFlip seating is the shining light of this machine and something that makes it stand out against all other competitors. If you’re looking for an all around UTV that won’t break the bank at $12,299, the Pioneer 700-4 is hard to beat. American Honda Motor Co., Inc., is the sole distributor of Honda motorcycles, scooters, ATVs and Side-by-Sides in the U.S. American Honda’s Motorcycle Division conducts the sales, marketing and operational activities for these products through independent authorized Honda retail dealers. For more information on Honda products, go to powersports.honda.com.